Shelley Housley and Marianne Spanier scored 0.35 masterpoints with a 54.87% game at Bridge On Shea. See full results of this game. Garrison Singer and Jill Grundland scored 0.69 masterpoints with a 53.72% game at Bridge On Shea. See full results of this game. Sheryl Martin and Dianne Schechter scored 0.69 masterpoints with a 53.59% game at Bridge On Shea. See full results of this game. Vinda Gross and Paula Cohen scored 1.64 masterpoints with a 54.31% game at Bridge On Shea. See full results of this game. Sonja Shiner and Dena Goldston scored 0.39 masterpoints with a 55% game at Bridge On Shea. See full results of this game. John Urciuoli and Scott Donaldson scored 0.43 masterpoints with a 53.15% game at In Tempo Bridge Club. See full results of this game. Julie Beckvall and Renee Prendergast scored 0.25 masterpoints with a 56.25% game at In Tempo Bridge Club. See full results of this game. Shelley Housley and Jennifer Oneill scored 0.30 masterpoints with a 50.14% game at Bridge On Shea. See full results of this game. Sonja Shiner and Paula Cohen scored 3.65 masterpoints with a ★67.99%★ game at Bridge On Shea. See full results of this game. Dawn Campbell and Garrison Singer scored 0.51 masterpoints with a 50% game at Bridge On Shea. See full results of this game. Chris McNaughton and Marvin Schenk scored 0.30 masterpoints with a 52.47% game at Bridge On Shea. See full results of this game. 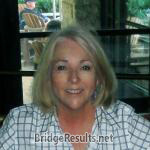 Sallie Dillian and Sharon Wallack scored 0.49 masterpoints with a 50% game at Bridge On Shea. See full results of this game. Julie Beckvall and Millicent Jones scored 0.44 masterpoints with a 49.45% game at In Tempo Bridge Club. See full results of this game. Clark Ransom and Joy Balser scored 0.83 masterpoints with a 54.42% game at Bridge On Shea. See full results of this game. Ellen Gross and Sharon Wallack scored 1.40 masterpoints with a 57.4% game at Bridge On Shea. See full results of this game. Suzette Wynn and Marvin Schenk scored 0.44 masterpoints with a 53.07% game at Bridge On Shea. See full results of this game. Dena Goldston and Pat Turberg scored 1.39 masterpoints with a 59.26% game at Bridge On Shea. See full results of this game. Sonja Shiner and Garrison Singer scored 0.31 masterpoints with a 51.29% game at Bridge On Shea. See full results of this game. Jean McCullough and Linda Ornstein scored 0.59 masterpoints with a 54.4% game at Bridge On Shea. See full results of this game. Barbara Steiner and Paula Cohen scored 1.87 masterpoints with a 59.29% game at Bridge On Shea. See full results of this game. Joan Cremin and Dawn Campbell scored 3.06 masterpoints with a ★62.14%★ game at Bridge On Shea. See full results of this game. David Ochiai and Shelley Housley scored 1.29 masterpoints with a 58.29% game at Bridge On Shea. See full results of this game. Paul Harris and Janet Newman scored 0.34 masterpoints with a 54.04% game at Bridge On Shea. See full results of this game. Henry Meurer and Garrison Singer scored 4.08 masterpoints with a ★63.82%★ game at Bridge On Shea. See full results of this game. Jess Cohen and Scott Donaldson scored 4.50 masterpoints with a 57.07% game at In Tempo Bridge Club. See full results of this game. Deborah Russell and Andy Neugarten scored 0.63 masterpoints with a 47.22% game at Bridge On Shea. See full results of this game. Richard Gitter and Mecha Mattson scored 6.00 masterpoints with a ★69.1%★ game at Bridge On Shea. See full results of this game. Judy Brew and Janet Newman scored 0.44 masterpoints with a 54.38% game at Bridge On Shea. See full results of this game. Shelley Housley and Kathy Litterman scored 0.27 masterpoints with a 51.82% game at Bridge On Shea. See full results of this game. Lawrence Teitel and Anne Marie Harrington scored 1.29 masterpoints with a 56.13% game at Bridge On Shea. See full results of this game. Ken Barbour and Scott Donaldson scored 1.25 masterpoints with a 57.57% game at Bridge On Shea. See full results of this game. Ken Batko and David Ochiai scored 0.55 masterpoints with a 50.36% game at Bridge On Shea. See full results of this game. Cathy Zinn and Fran Bernstein scored 0.28 masterpoints with a 49.26% game at In Tempo Bridge Club. See full results of this game. Carol Kasle and Sharon Wallack scored 0.25 masterpoints with a 51.01% game at In Tempo Bridge Club. See full results of this game. Jerry Gaer and Scott Donaldson scored 1.07 masterpoints with a 57.29% game at In Tempo Bridge Club. See full results of this game. Dianne Schechter and Sheryl Martin scored 0.32 masterpoints with a 55.63% game at Bridge On Shea. See full results of this game. Julie Beckvall and Renee Prendergast scored 0.24 masterpoints with a 58.57% game at In Tempo Bridge Club. See full results of this game. Richard Peress and Scott Donaldson scored 3.94 masterpoints with a ★60.65%★ game at In Tempo Bridge Club. See full results of this game. Fran Bernstein and Judy McNaughton scored 0.82 masterpoints with a 52.31% game at Bridge On Shea. See full results of this game. Sheryl Martin and Shelley Housley scored 1.33 masterpoints with a 58.08% game at Bridge On Shea. See full results of this game. Chris McNaughton and Marvin Schenk scored 2.13 masterpoints with a ★61.67%★ game at Bridge On Shea. See full results of this game. Allen Silberman and Sharon Wallack scored 0.60 masterpoints with a 52.31% game at Bridge On Shea. See full results of this game. Sonja Shiner and Bernie Katchen scored 0.88 masterpoints with a 55.32% game at Bridge On Shea. See full results of this game. Linda Ornstein and Jean McCullough scored 1.39 masterpoints with a 57.41% game at Bridge On Shea. See full results of this game. John Urciuoli and Dena Goldston scored 1.07 masterpoints with a 55.29% game at In Tempo Bridge Club. See full results of this game. Marc Raphael and Pat Turberg scored 1.42 masterpoints with a 55.77% game at In Tempo Bridge Club. See full results of this game. Deborah Russell and Andy Neugarten scored 1.35 masterpoints with a IMP game at Bridge On Shea. See full results of this game. Sharon Teitel and Dianne Schechter scored 1.23 masterpoints with a IMP game at Bridge On Shea. See full results of this game. Andy De Leon and Janet Newman scored 3.94 masterpoints with a IMP game at Bridge On Shea. See full results of this game. Mecha Mattson and Dee Horwitz scored 0.35 masterpoints with a 51.28% game at Bridge On Shea. See full results of this game. Fran Bernstein and Bill Berry scored 0.54 masterpoints with a 50.21% game at Bridge On Shea. See full results of this game. Shelley Housley and Linda Mitchell scored 1.34 masterpoints with a ★60.58%★ game at Bridge On Shea. See full results of this game. Chris McNaughton and Marvin Schenk scored 0.74 masterpoints with a 58.01% game at Bridge On Shea. See full results of this game. Sonja Shiner and Randee Dorman scored 0.42 masterpoints with a 57.37% game at Bridge On Shea. See full results of this game. David Ochiai and Chris McNaughton scored 1.24 masterpoints with a 59.44% game at Bridge On Shea. See full results of this game. Howard Kalender and Garrison Singer scored 0.50 masterpoints with a 52.75% game at Bridge On Shea. See full results of this game. Paula Cohen and Pat Turberg scored 1.74 masterpoints with a 59.7% game at Bridge On Shea. See full results of this game. Murali Nair and Scott Donaldson scored 0.70 masterpoints with a 54.4% game at In Tempo Bridge Club. See full results of this game. Dianne Schechter and Anne Marie Harrington scored 0.98 masterpoints with a 50.72% game at Bridge On Shea. See full results of this game. Pat Sandler and Paula Cohen scored 0.31 masterpoints with a 52.24% game at Bridge On Shea. See full results of this game. Julie Beckvall and Ellen Tryba scored 0.21 masterpoints with a 50.97% game at In Tempo Bridge Club. See full results of this game. 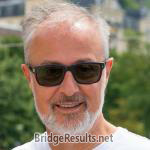 Martin Coppe and Anne Marie Harrington scored 2.53 masterpoints with a 58.96% game at In Tempo Bridge Club. See full results of this game. John Urciuoli and Scott Donaldson scored 0.33 masterpoints with a 52.81% game at In Tempo Bridge Club. See full results of this game. Vinda Gross and Paula Cohen scored 0.89 masterpoints with a 52.79% game at Bridge On Shea. See full results of this game. Monique Greene and Mecha Mattson scored 1.12 masterpoints with a 53.75% game at Bridge On Shea. See full results of this game. Norm Lynn and Chris McNaughton scored 4.52 masterpoints with a ★63.46%★ game at Bridge On Shea. See full results of this game. Dianne Schechter and Sheryl Martin scored 0.28 masterpoints with a 50.58% game at Bridge On Shea. See full results of this game. Jean Joseph and Sharon Wallack scored 0.44 masterpoints with a 51.54% game at Bridge On Shea. See full results of this game. Mark Litterman and Shelley Housley scored 0.38 masterpoints with a 54.13% game at Bridge On Shea. See full results of this game. Sonja Shiner and Dena Goldston scored 0.79 masterpoints with a 56.73% game at Bridge On Shea. See full results of this game. Tom Wylie and David Ochiai scored 0.23 masterpoints with a 49.9% game at Bridge On Shea. See full results of this game. Silas Wasserstrom and Garrison Singer scored 2.00 masterpoints with a 59.81% game at Bridge On Shea. See full results of this game. Penny Fisher and Julie Beckvall scored 0.25 masterpoints with a 58.75% game at In Tempo Bridge Club. See full results of this game. James Miller and Scott Donaldson scored 0.69 masterpoints with a 51.53% game at In Tempo Bridge Club. See full results of this game. Chris McNaughton and Marvin Schenk scored 0.87 masterpoints with a 58.37% game at Bridge On Shea. See full results of this game. Garrison Singer and Jill Grundland scored 0.34 masterpoints with a 50.79% game at Bridge On Shea. See full results of this game. Mecha Mattson and Sharon Teitel scored 1.94 masterpoints with a 54.52% game at Bridge On Shea. See full results of this game. Ellen Gross and Barbara Sacks scored 1.46 masterpoints with a 54.07% game at Bridge On Shea. See full results of this game. Andy De Leon and Janet Newman scored 1.75 masterpoints with a IMP game at Bridge On Shea. See full results of this game. Deborah Russell and Andy Neugarten scored 0.64 masterpoints with a IMP game at Bridge On Shea. See full results of this game. Sallie Dillian and Leon Gildin scored 0.73 masterpoints with a 52.7% game at Bridge On Shea. See full results of this game. Shelley Housley and MacRae Kennedy scored 0.73 masterpoints with a 54.17% game at Bridge On Shea. See full results of this game. Sonja Shiner and Tom Wylie scored 2.19 masterpoints with a ★60.99%★ game at Bridge On Shea. See full results of this game. Chris McNaughton and Jean McCullough scored 3.07 masterpoints with a ★60.77%★ game at Bridge On Shea. See full results of this game. Cookie Rich and Paula Cohen scored 0.36 masterpoints with a 48.75% game at Bridge On Shea. See full results of this game. Shelley Housley and David Ochiai scored 1.48 masterpoints with a 58.08% game at Bridge On Shea. See full results of this game. Ellen Gross and Randee Dorman scored 1.97 masterpoints with a 59.17% game at Bridge On Shea. See full results of this game. Dena Goldston and Marianne Spanier scored 0.26 masterpoints with a 51.15% game at Bridge On Shea. See full results of this game. Garrison Singer and Sandy Belfer scored 1.44 masterpoints with a 55.38% game at Bridge On Shea. See full results of this game. Mecha Mattson and Dee Horwitz scored 0.33 masterpoints with a 53.94% game at Bridge On Shea. See full results of this game. Anne Marie Harrington and Joan Beuchel scored 2.22 masterpoints with a 57.18% game at In Tempo Bridge Club. See full results of this game. Mark Litterman and Shelley Housley scored 1.42 masterpoints with a 57.13% game at Bridge On Shea. See full results of this game. Ken Batko and David Ochiai scored 1.84 masterpoints with a 56.65% game at Bridge On Shea. See full results of this game. Andy Neugarten and Deborah Russell scored 0.51 masterpoints with a 47.84% game at Bridge On Shea. See full results of this game. Kirt Hall and Marvin Schenk scored 0.28 masterpoints with a 53.53% game at Bridge On Shea. See full results of this game. Randee Dorman and Pat Turberg scored 1.38 masterpoints with a 55.53% game at Bridge On Shea. See full results of this game. Howard Kalender and Garrison Singer scored 0.21 masterpoints with a 48.48% game at Bridge On Shea. See full results of this game. Joan Cremin and Haig Tchamitch scored 2.53 masterpoints with a 59.08% game at Bridge On Shea. See full results of this game. Garrison Singer and Jill Grundland scored 1.50 masterpoints with a 57.16% game at Bridge On Shea. See full results of this game. Sudhakar Divakaruni and Mecha Mattson scored 1.11 masterpoints with a 55.2% game at Bridge On Shea. See full results of this game. Shelley Housley and Jessie Brunswig scored 3.38 masterpoints with a 59.8% game at Bridge On Shea. See full results of this game. Julie Beckvall and Ellen Tryba scored 0.53 masterpoints with a 54.05% game at In Tempo Bridge Club. See full results of this game. Vinda Gross and Paula Cohen scored 1.13 masterpoints with a 58.43% game at Bridge On Shea. See full results of this game. Silas Wasserstrom and Garrison Singer scored 0.48 masterpoints with a 53.46% game at Bridge On Shea. See full results of this game. Dianne Schechter and Sheryl Martin scored 1.73 masterpoints with a ★63.25%★ game at Bridge On Shea. See full results of this game. Sandy Belfer and Joan Cremin scored 0.19 masterpoints with a 51.79% game at Bridge On Shea. See full results of this game. Sonja Shiner and Dena Goldston scored 0.46 masterpoints with a 53.99% game at Bridge On Shea. See full results of this game. Anne Marie Harrington and Susan Kay Schultz scored 0.67 masterpoints with a 54.17% game at In Tempo Bridge Club. See full results of this game. Mark Robertson and Janet Newman scored 0.55 masterpoints with a 52.23% game at In Tempo Bridge Club. See full results of this game. Jerry Gaer and Scott Donaldson scored 1.69 masterpoints with a 57.14% game at In Tempo Bridge Club. See full results of this game. Jerry Gaer and Scott Donaldson scored 0.92 masterpoints with a 53.83% game at In Tempo Bridge Club. See full results of this game. Bunny Bullard and Jean McCullough scored 2.04 masterpoints with a ★62.14%★ game at Bridge On Shea. See full results of this game. Mecha Mattson and Sharon Wallack scored 0.71 masterpoints with a 56.64% game at Bridge On Shea. See full results of this game. Ellen Gross and Randee Dorman scored 0.34 masterpoints with a 53.78% game at Bridge On Shea. See full results of this game. Sonja Shiner and Paula Cohen scored 1.02 masterpoints with a 57.81% game at Bridge On Shea. See full results of this game. Ken Batko and David Ochiai scored 1.43 masterpoints with a 57.81% game at Bridge On Shea. See full results of this game. Linda Ornstein and Jean McCullough scored 2.09 masterpoints with a 59.62% game at Bridge On Shea. See full results of this game. Andy De Leon and Janet Newman scored 0.44 masterpoints with a 57.17% game at Bridge On Shea. See full results of this game. John Urciuoli and Dena Goldston scored 0.67 masterpoints with a 57.34% game at Bridge On Shea. See full results of this game. Ellen Gross and Sharon Wallack scored 1.18 masterpoints with a 57.78% game at Bridge On Shea. See full results of this game. Julie Beckvall and Millicent Jones scored 0.29 masterpoints with a 52.4% game at In Tempo Bridge Club. See full results of this game. Cathy Zinn and Fran Bernstein scored 0.28 masterpoints with a 47.53% game at In Tempo Bridge Club. See full results of this game. Richard Peress and Scott Donaldson scored 1.27 masterpoints with a 54.12% game at In Tempo Bridge Club. See full results of this game. Paula Cohen and Cookie Rich scored 0.72 masterpoints with a 53.61% game at Bridge On Shea. See full results of this game. David Ochiai and Don Housley scored 1.50 masterpoints with a 57.33% game at Bridge On Shea. See full results of this game. Sallie Dillian and Mary Olsky scored 0.67 masterpoints with a 52.04% game at Bridge On Shea. See full results of this game. Sharon Wallack and Dianne Schechter scored 0.99 masterpoints with a 56.49% game at Bridge On Shea. See full results of this game. Judith Washor and Jean McCullough scored 1.35 masterpoints with a 59.5% game at Bridge On Shea. See full results of this game. Penny Keaton and Julie Beckvall scored 0.44 masterpoints with a 55.87% game at In Tempo Bridge Club. See full results of this game. Murali Nair and Scott Donaldson scored 0.85 masterpoints with a 55.87% game at In Tempo Bridge Club. See full results of this game. Sonja Shiner and Sharon Wallack scored 1.91 masterpoints with a ★61%★ game at Bridge On Shea. See full results of this game. Ellen Gross and Jill Polacheck scored 0.44 masterpoints with a 52.67% game at Bridge On Shea. See full results of this game. Paula Cohen and Pat Turberg scored 1.43 masterpoints with a ★60.26%★ game at Bridge On Shea. See full results of this game. Anne Marie Harrington and Marvin Schenk scored 0.67 masterpoints with a 57.48% game at Bridge On Shea. See full results of this game. Dianne Schechter and Mecha Mattson scored 2.55 masterpoints with a ★63.14%★ game at Bridge On Shea. See full results of this game. Barbara Sacks and Sharon Wallack scored 1.13 masterpoints with a 54.56% game at Bridge On Shea. See full results of this game. Silas Wasserstrom and Garrison Singer scored 0.84 masterpoints with a 54.59% game at Bridge On Shea. See full results of this game. Ellen Gross and Pat Turberg scored 0.34 masterpoints with a 51.8% game at Bridge On Shea. See full results of this game.